Now that winter is definitley over and all the dead plants have been cleaned up and a few new ones planted, it is time to try to make the patio a little more inviting. We have a small yard, this is the view I see while having my coffee. I grow a lot of things in pots, living in the desert, that's the best way to go for flowers. You can also see a couple of new bushes that were planted to replace a couple that we lost during winter. 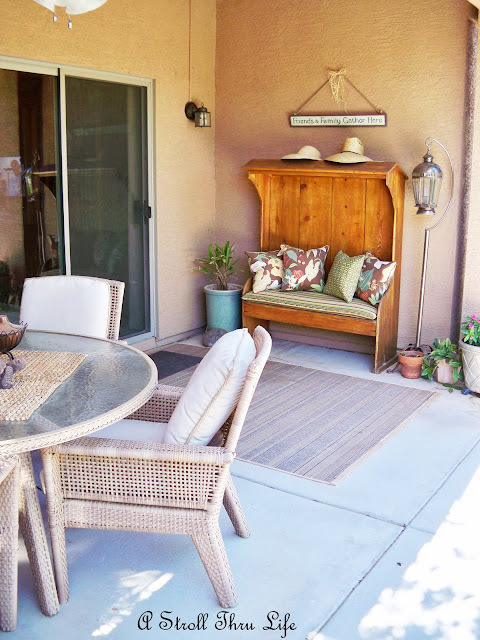 So are you ready to be outside and enjoy your patio? Don't forget, spread the work about our Cloche Party on May 22nd. Get all of your cloches ready for a super fun party and let's show them off. I love your patio, Marty ... you have everything there for enjoyable dinners, drinks or just enjoying a good read! Your new plantings look fabulous ... wonderful pops of color, too! Your patio would be just the righ size for me, Marty. It looks lovely and I could just imagine enjoying your morning coffee here. You've got a lovely view, too. By the looks of your yard, you'd never realize how hot it gets there. Marty your patio looks very cozy there especially in the shaded part. 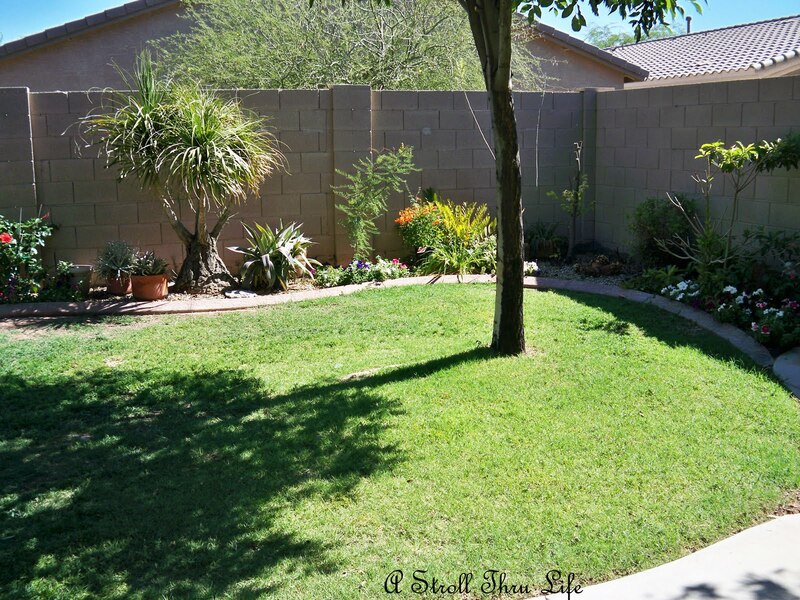 It's so hard to believe you are in the desert there with that beautiful yard. Y'all have done an amazing job! I love the little grill area too. I love the new plant choices and hope they will do great as well! Your patio looks so inviting and cool, Marty. It was a smart move to extend the area to include your grill. 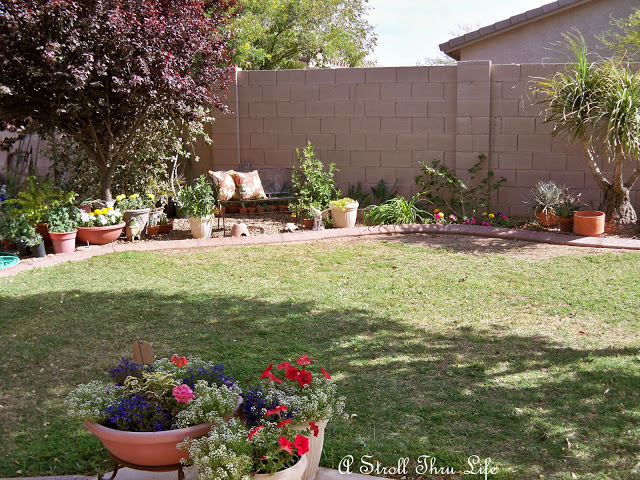 Your back yard looks very pretty, too! it is perfect- a great size, charming and has everything I would love to have ona patio! I really like your patio and yard, Marty. 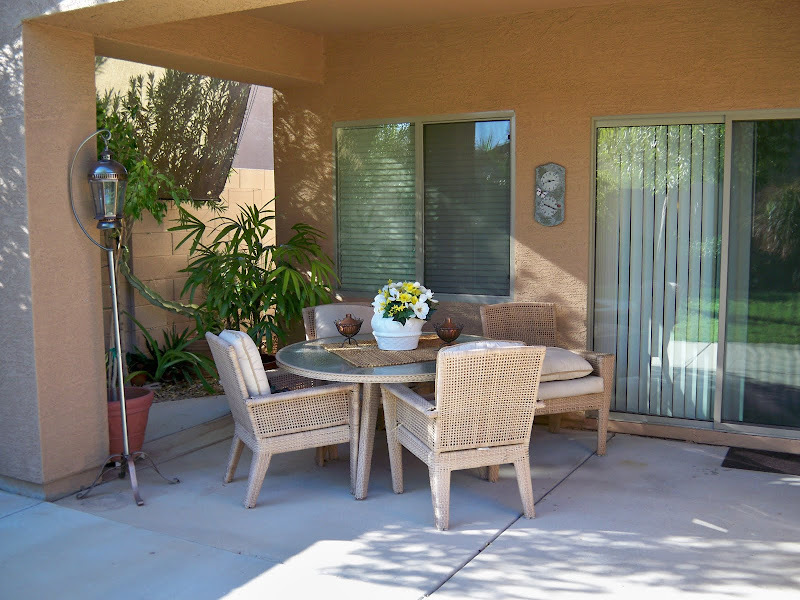 Your patio is large and there's plenty of room to entertain. I just can't imagine living in the desert! You're lucky to have a covered area to eat outside. That is nice! We have been grilling out a lot too. There's nothing better during the warm months to smell that grill going and not have to clean up as much in the kitchen! The plants get more sturdy if they are old enough when the first freeze occurs. In the past I've had bouganvilla die to the ground. But this year, the frost lasted several days in a row. Covering them with a sheet helped some, but some died. I lost most of the new flowering plants. Fortunately I lost only one tree. There was no green in the branches of the trees, so my spouse cut it down, but it sprung from the base and is already three feet tall. It looks like a bush now. I'll have to train it. I love your cozy yard and patio. We have been eating on the deck and patio for about two weeks now. My flower garden and roses are in full bloom now. The day lilies started blooming yesterday. Your patio and backyard looks amazing. Very clean and organized. I've been sprucing up our backyard this week with new plantings and trying to get rid of all the yellow/green pollen. We've had a terrible year for the yellow fuzzy stuff and it takes a while to get it off everything. I've had several plants die this year too due to the winter, trying to replace them too with something more tolerant. Yard work always keeps us busy, doesn't it? Your patio looks so pretty, love that bench. The flowers in the pots look so pretty with the pops of color. Great place to enjoy that morning coffee. I looks like a great place to hang out. Your plants look good. I imagine it's a bit of work to keep them watered and not perishing from the heat. We're getting pollen now and things are covered in yellow. I'm just starting to plant things here. What a lovely place to spend time with your coffee! I love the curved bed and all your potted plants! Living in the desert must have challenges for gardening...we certainly have to spend time trying new things here in Oklahoma. Enjoy your patio this spring!! Your patio is small but inviting Marty! I would love to put some outdoor curtains on each side of your patio, it would look even more gorgeous! This reminds me of the huge task I have for this coming weekend - mine is a little bigger than yours and that means MORE CLEANING! Have a wonderful day dear! I love your covered patio, Marty! You have "carved" a delightful and cosy spot for yourselves most defininately! I started cleaning up my patio recently too. I should share that, shouldn't I? Have a blessed day. Hugs. It looks like the perfect place to have morning coffee or enjoy a grilled meal! 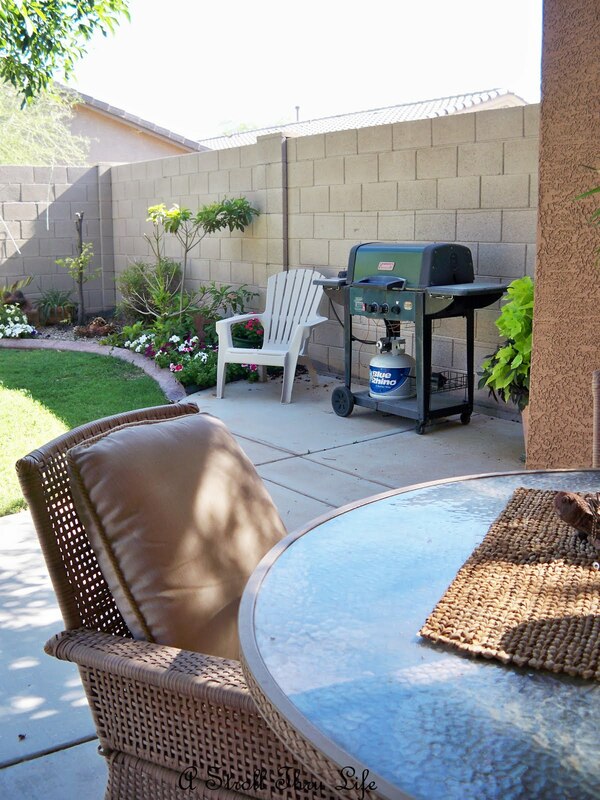 Your patio and garden look so well cared for, what a delightful spot to relax! Your bench is so unusual, I know that's a conversation piece! Your patio is beautiful! It looks like the perfect place to relax!We don't have a patio yet it is on our list of things to be done in the future. 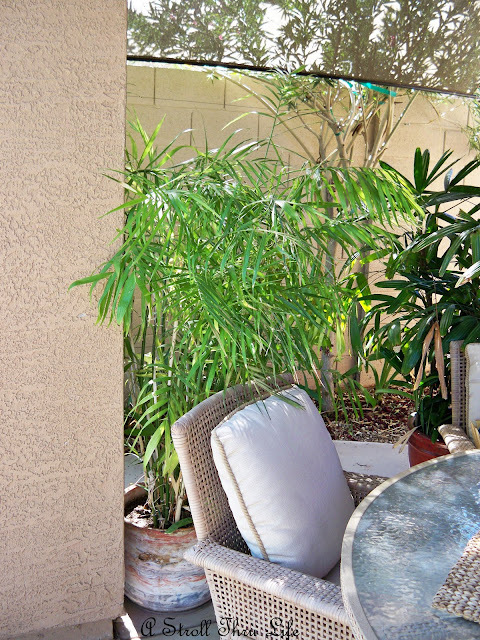 Your patio always looks so welcoming. Great yard too! Have a fabulous summer!! 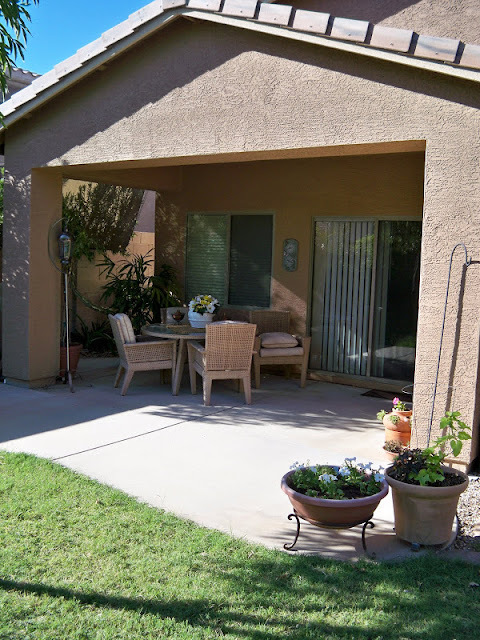 Your patio looks great and I love your plants and flowers! Your grass is pretty and green too. We love to grill too and living in Florida, it does help not having to cook indoors. The stove top isn't so bad, but the oven turns the whole house into an oven during the summer. I love your patio table and chairs, and that cute bench. Your annuals look so pretty too! I am still trying to find a time to get out to visit. My Mom has had more health problems and that is what has held me up. Your patio is beautiful! Perfect size and you have it decorated so pretty! I love all your flowers and plants! Very pretty! Love your patio space. The garden areas look great, too. I have been waiting to finish up out on our screened in porch. I am waiting for the pollen to get done floating around, makes a layer of yellow dust. Once this is over I will be ready to go, we spend a great deal of time out there, love it. If I had my morning coffee in this most tranquil space, I'd be so relaxed, I'd probably fall into a soothing slumber! Love your pretty flowers! I believe in the 80/20 rule. you know, where 80% of all reward comes from 20% of the effort? Well, I believe your blog is that 20%. I've added you to the list of sites that I frequent. Thank you for the in depth and detailed blog posts. Not many people are willing to do that anymore.